I’m not good about getting up early, so on weekdays I typically eat breakfast at work. 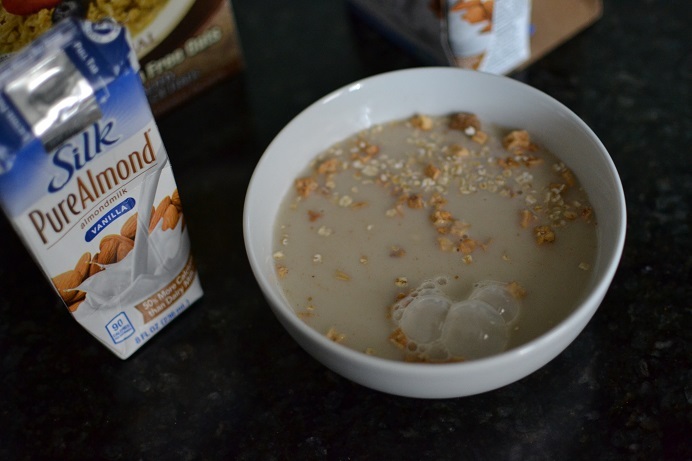 Growing up, I was always a Honey Nut Cheerios+milk kind of kid. My mom – she’s the sweetest – would fry an egg and if I was lucky, sausages. 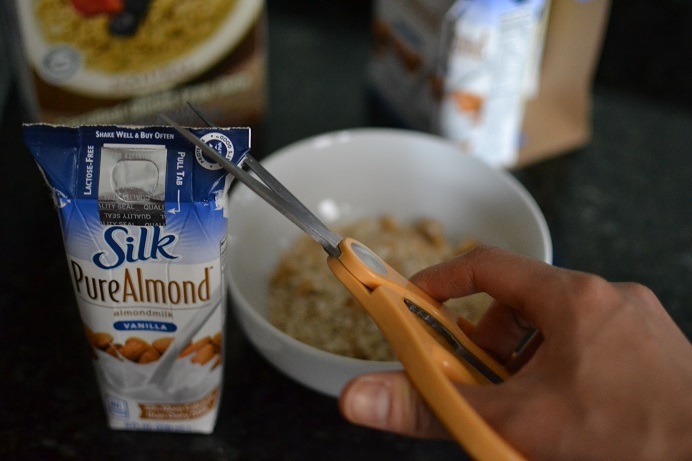 I recently started drinking rice milk instead of cow’s milk. 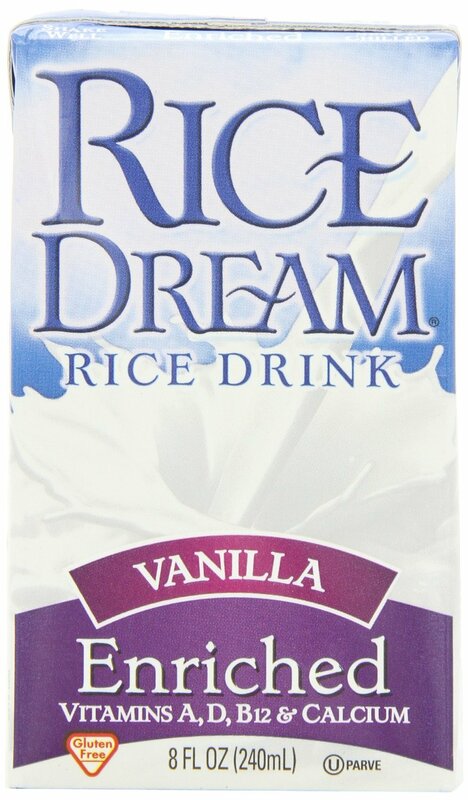 Rice milk spoils less quickly (I have yet to drink spoiled rice milk) and is lighter and sweeter. They can be fortified with vitamins and calcium just like regular milk. A half gallon costs $2.99 at Trader Joe’s. 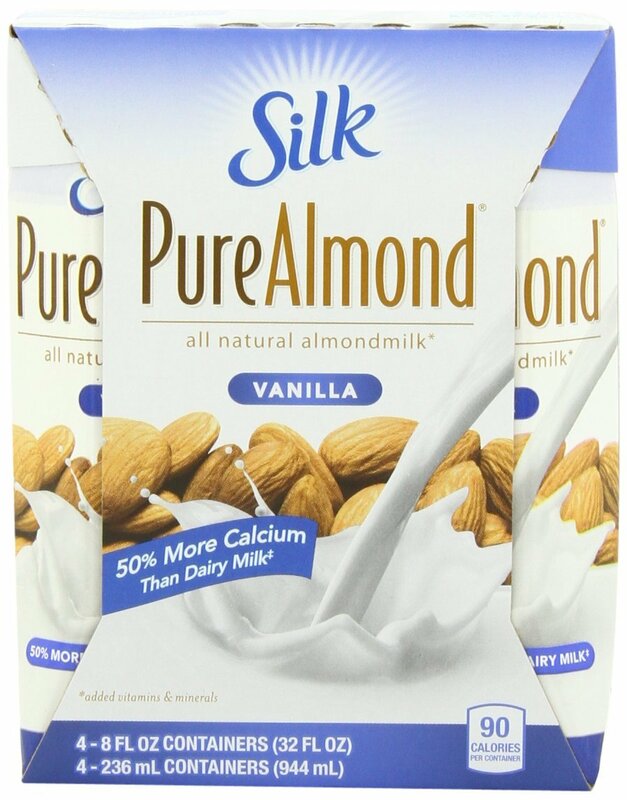 Regular milk and milk alternatives are also sold in small 8 oz boxes – just like juice boxes – that don’t need to be refrigerated! They keep for a long time (months) too, so I always keep a stash of these babies in my desk at work. Not all milks are created equal. 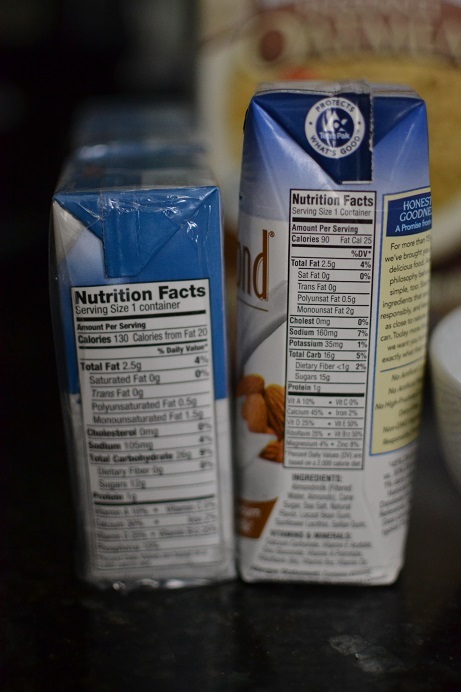 You can see that the rice milk has 40 more calories, though both have an obscene amount of sugar. I also keep a stash of single serving oatmeal packets. 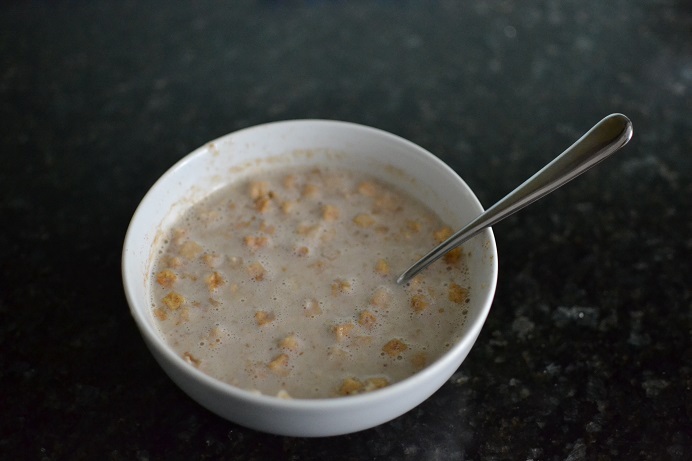 You can buy any variety of oatmeal you want – in this post I’m using Glutenfreeda apple cinnamon with flax. Then I have my trusty cereal bowl and I’m all ready to go. 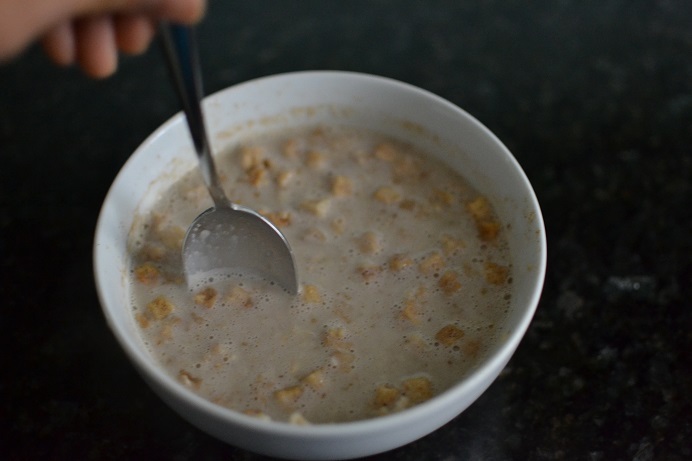 Then pour (you can squeeze – carefully – to make the liquid pour out faster) over your oatmeal. Once you’re done, it’s time to microwave it. 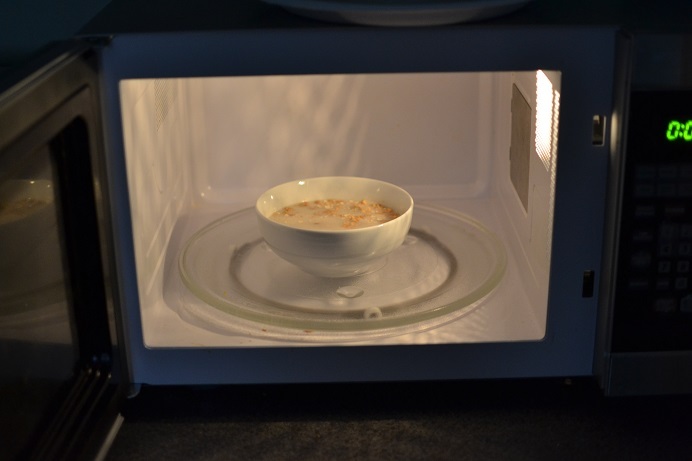 I microwave my bowl on the default setting for about 2 minutes. 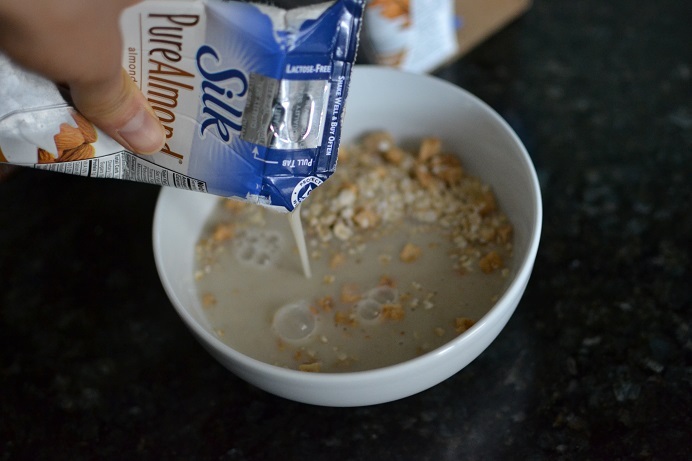 The first time you do this, the milk may bubble over, so be sure to watch it – especially around the 1.5 minute mark. 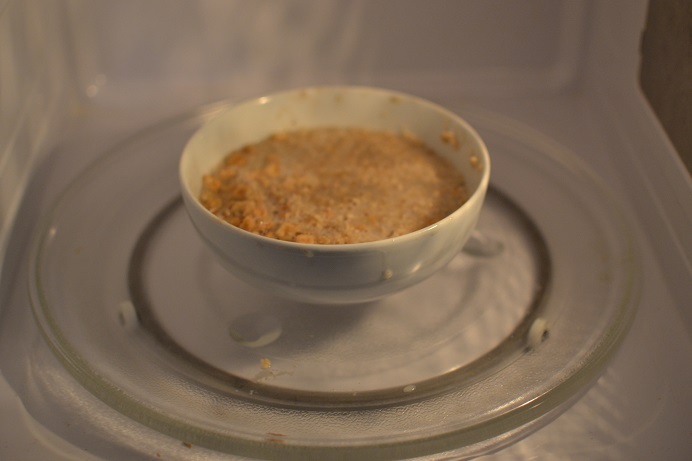 Once it’s done, remove (careful – the bowl will be hot) your bowl. And your breakfast is ready! 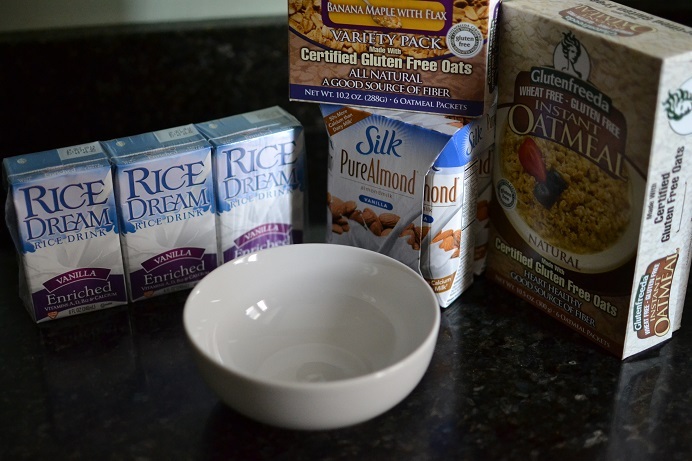 If you use plain oatmeal, you can make your own mini oatmeal bar. 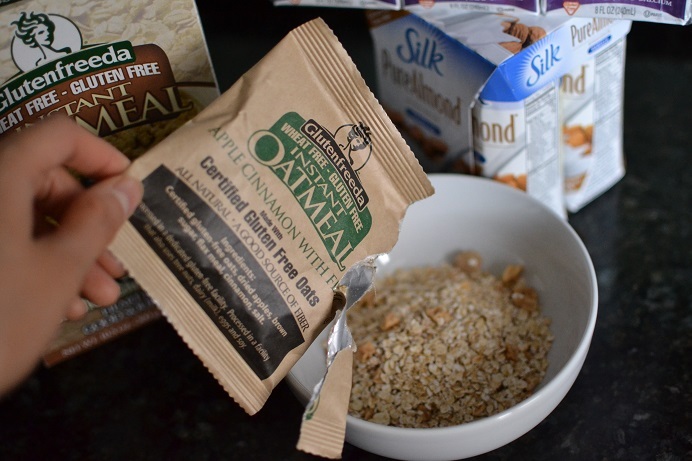 You add fresh fruit, dried cranberries, raisins, freeze-dried fruit, protein powder, honey, maple syrup…it’s like thinking of toppings for pizza, or ice cream – except it’s breakfast and you’re having oatmeal! 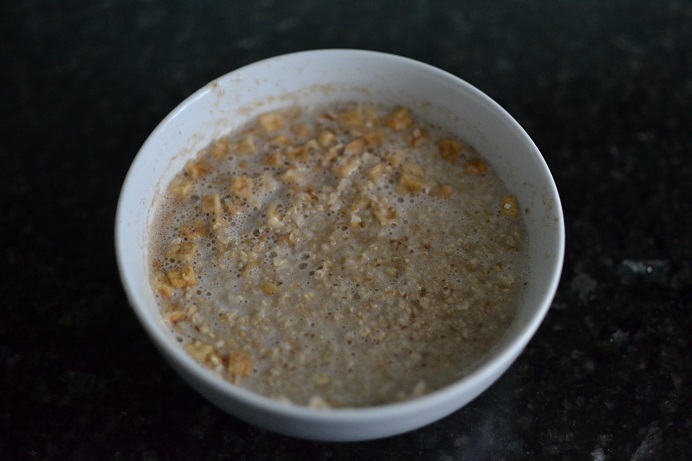 Society tends to give oatmeal a bland image, but for people like me who don’t have a lot of time in the morning and don’t want to have to think about what to make, oatmeal is easy and versatile and the perfect way to start my morning. It also tends to fill me up (Often I’ll eat a banana or other piece of fruit along with it) until I’m ready for lunch. 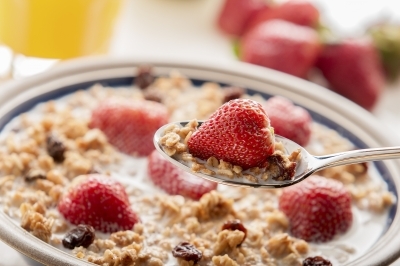 What’s your favorite easy breakfast?